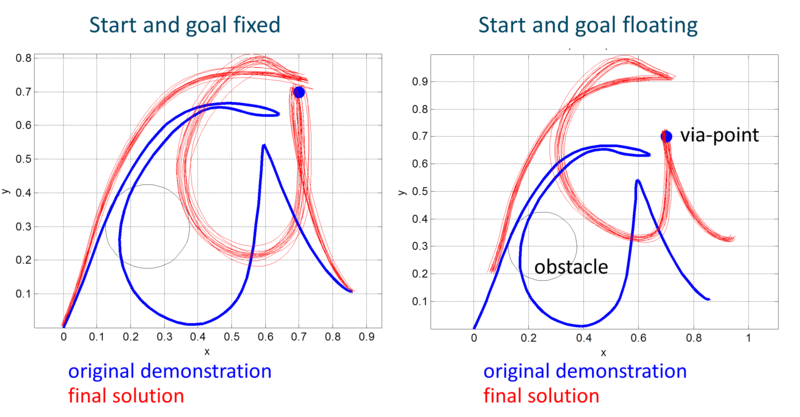 Here you find a minimalist code in Matlab that uses stochastic optimization for motion planning. It is inspired by a few methods: it uses the exploration of parameters proposed in STOMP, with code based on the Pi2 implementation, and the update efficiency of REPS. Despite the code being inspired by different methods, I tried to make its structure as simple as possible. Partially because it does not need the DMPs of Pi2 (as in STOMP), and because the episodic version of REPS can be implemented in a few lines of code. The main advantage is the fact that you do not need gradients, and the method works even when the cost is badly behaved, with plateaus and discontinuities. The code that you can find here will run in two different modes. In the first run, the start and goal states are anchored. In the second run, the start and goal are free to float, which allows the solution to preserve more of the original starting shape. The latter was particularly useful to solve the problem described in this paper (which you can also cite if you use the code).